Recently I was asked for some "best practices" for email marketing. Email is the only permission based marketing program. Consumers willingly give you their information and permission to market to them, usually because they are engaged with your brand/business. 1.) My first tip? Never rent a list. Build your own. Sure it takes time, but it will pay dividends in the long run. I keep three "generic" email accounts that I only use to see who is buying and selling my information. Occasionally, I will use one of these accounts to register for an offer on a website just to see what happens. I never use these accounts as a means for communicating. With this permission comes an expectation that you will continue to send relevant content. Note it does not say "constant sales pitches". Depending on your business, email is a great way to educate consumers about your products/services as they educate themselves, prior to making the purchasing decision. 3.) In addition to education, I also include a Call To Action in the email so the individual can respond easily if they choose to do so. And finally, make sure your email template is mobile responsive. The majority of all emails are opened on mobile devices today. 4.) Send email from a person - not noreply@,domain.com or marketing@domain.com. "People do business with people, not companies." Using a name adds a touch of humanity. "But Jeff, I don't want people to have my email address. Perhaps you shouldn't be sending emails then. 5.) Preview and test your emails before sending them. Run spell check first. If you need a great tool that works across most platforms, I have had great success using the free version of Grammarly. They provide a browser plugin that runs in the background and it allows you to add new words to the dictionary on the fly. And make sure your email template is mobile responsive. Our CRM is Hubspot and they provide a tool to preview emails in a number of mobile formats before you send them. Here is a link to an article showcasing 5 Email Preview Tools. I can vouch for Litmus. 6.) Don't be afraid to 'clean up' your email list. In fact, CLEAN UP YOUR EMAIL LIST. It is not an option. Many clients are reluctant to remove people form their list because they value "the number of emails they are sending out every month". "I send out 12,000 emails every month!" We currently send out emails using Hubspot. Within hours/days of sending out an email we start to get reporting on the email and the email list we have built and use. Here is a report on the latest ySite email. This is telling me that we sent this email to 1,042 recipients and 32 of these emails (3.1%) bounced. This is higher than our average of 1.47% In this case, as I reviewed the addresses that bounced, it was the result of higher then normal turnover at the YMCAs we communicate with. Our list of YMCA emails started with 2,000 email addresses. So why are we only sending to 1,042 individuals? Because our email system, Hubspot, uses intelligence that monitors how engaged the individuals are with the messages we are sending. Over time, it monitors whether or not people are opening the emails we are sending. If someone doesn't open three consecutive emails and then they open one, they stay on the send list. If it notices that someone has not opened any of the last eight emails, it determines that this individual is not engaged with the messages we are sending and suppresses the individual from the list. The contact information stays in the database, they are only removed from this list. So we are now confident that we have 1,000 individuals who look forward to seeing our messages. Finally, here is the final report. 1,005 successful deliveries. 37 Bounces. 7 Unsubscribes. 0 Spam reports. Note that the number of successful deliveries will vary each month due to bounces and unsubscribes. But don't forget that we are actively building our list, adding new subscribers every month so it typically continues to grow. 7.) Abide by CAM-SPAM rules. One of the most important rules is to make it easy to opt out of your emails and never send email to someone who doesn't want it. PERIOD. There are severe penalties for doing so. The CAN-SPAM Act is enforced primarily by the Federal Trade Commission (FTC), which can seek civil penalties of up to $16,000 per violation (with no maximum penalty). Equally important - it is simply bad business. BONUS TIP - The emails that are never opened are still a powerful opportunity to get your message out there. Every email client shows a subject line so be sure to keep this in mind as you craft your message. Free advertising! Best wishes and keep on emailing! Questions? 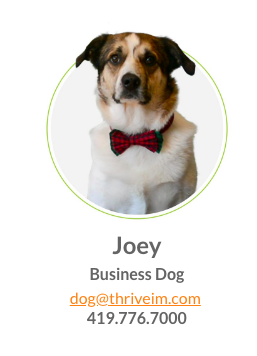 Email jeff@thriveim.com or dog@thriveim,com.